Shearwater is hosting the 2nd Annual 5K on the Trails & Fun Run on Saturday, April 21st at 8 am! 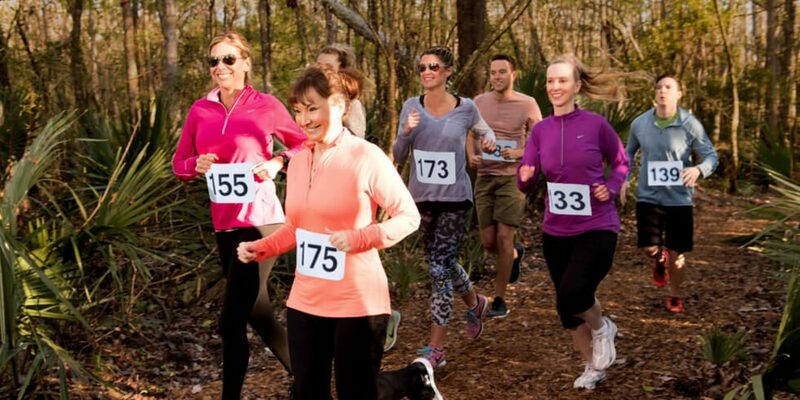 Register here to celebrate Earth Day on Shearwater’s 15 miles of nature trails while raising money for St. John’s County area schools. Make sure to stick around after the race for our Earth Day Festival at the Kayak Club with music, games and refreshments! Whether taking on Shearwater’s 5K on the Trails & Fun Run or any other competitive races in the area, proper training beforehand is key. At Shearwater, you don’t need to pack up and drive across town to log some miles. You can complete all of your training without ever leaving the community! Running a marathon or 5K is no easy task and requires stamina. The only way to get ready for these races is through consistent training. More than 15 miles of trails weave throughout Shearwater’s neighborhoods meaning a trailhead is never more than a few steps from your home. And with so much ground to cover, you can actually run an entire marathon without ever leaving the community! A triathlon’s three events usually consist of running, biking and swimming. These competitions require a unique blend of training, all of which can be completed at Shearwater. The 15 miles of natural, paved and boardwalk trails provide plenty of opportunities to run and bike, or you can escape the weather and do your training indoors at the Fitness Lodge. The Fitness Lodge features plenty of cardio equipment, including state-of-the-art Expresso Bikes that allow you to compete virtually with people all over the world. And to work on your strokes and endurance, head right outside to the regulation-sized multi-lane Lap Pool. Shearwater is a community built around the health and wellness of its residents. Interested in learning more? Join our Interest List to stay up-to-date on this new community.